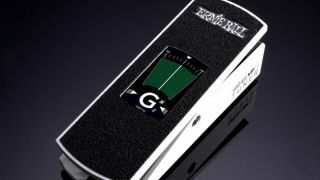 New two-in-one unit boasts touch-screen digital tuner and volume control. After teasing the new pedal prior to NAMM, Ernie Ball has officially unveiled the VPJR, a two-in-one unit that offers an enhanced-definition digital tuner along with volume control. The chromatic tuner is equipped with a touch screen that boasts a large graphic display that is easy to see and operate under low light stage conditions. The display automatically switches between tuner and volume modes depending on the signal level, allowing the player to tune at minimal volume. There are also “always on" configurations that are accessible via a double tap on the touch screen. Additionally, the tuner can be calibrated to a variety of reference pitches. There’s also a discrete buffer circuit with no tone loss through any signal chain; a case made from aircraft-grade aluminum; and a PVC-coated braided Kevlar cord. The VPJR is being offered in gold, black, red, and white. For more information, head over to Ernie Ball.